Fashions change constantly – especially for women. In early Victorian England fashionable women were wearing yards of usually black cloth with their bodies crushed inside spring steel and whalebone corsets. This particular combination severely constrained their movement, and clearly without freedom of dress there was little freedom of movement – and possibly even of ideas. North Devonians, often seen as very conservative not to say old-fashioned, must have been astonished when in December 1851 a Mrs.Franklin staged a public meeting in Bideford where she spoke on the need for a more ‘liberated’ style of dress – whilst wearing one of the new-fangled ‘Bloomer’ costumes! Apparently the audience wasn’t that large and amongst the ones who did attend there were few women, it being noted at the time that if they had attended they would have been ‘proud of their sister orator who, we venture to assert without hesitation, would have put many of our masculine platformers to the blush. Her style throughout was lucid, eloquent and convincing.’ A nicely patronising touch there – clearly written by a man. Unfortunately the ‘Bloomer’ costume never took off as it was mercilessly mocked in the newspapers and magazines of the day – though the freer style of dress did make a triumphant return in the 1890s and 1900s when women followed men by taking up cycling and adopted a much looser style of costume. 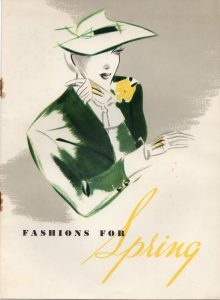 Chopes didn’t just rely on casual passers-by – they also issued catalogues illustrating the latest fashions with an offer to make up the designs for customers. These catalogues are a wonderful source of fashion designs and doubtless the arrival of the latest ‘Chope’s book’ was a red-letter day in many households. The earliest surviving one I have seen dates from 1901 and shows some ludicrously wasp-waisted women wearing classic sweeping Victorian dresses and carrying stick-thin parasols. Chope’s did also sell corsets so perhaps these waists were achievable but I doubt it. The firm continued issuing such guides for some decades after that. 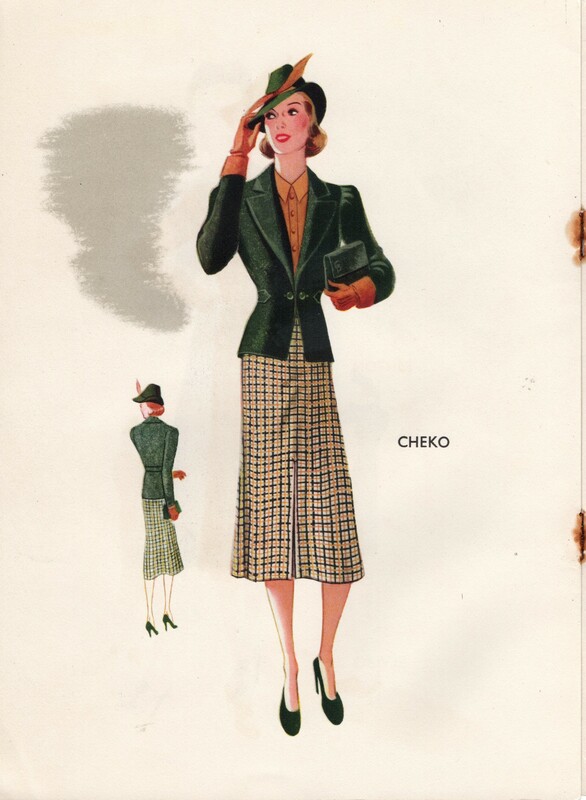 An undated catalogue which was probably issued in the 1940s strikes a rather contemporary note when it included a letter from the store which notes ‘This brochure gives some suggestions for tailored styles, any of which can be copied in our workrooms. We make a speciality of adapting youthful styles for larger figures.’ What a wonderfully polite way of putting it! I here reproduce two of the fashion plates inside, the one on the left just out of an Agatha Christie novel! 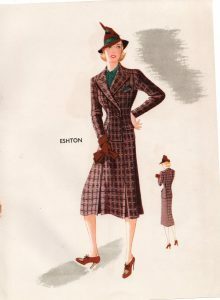 It is odd to think that these very fashionable clothes would now fall into the category of ‘retro’ or even ‘vintage’ today – if any have survived! This entry was posted in History and tagged Amelia Bloomer, bideford, Chope's, fashion, WH Chope. Bookmark the permalink.